We do not curently have theatre tickets available for Papa Roach This could be because we have simply sold out or it could be that this show is no longer running. The information on this page remains purely for historical and informational purposes. 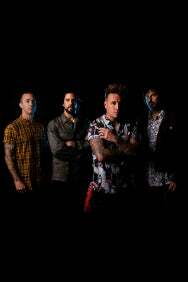 Over the past two decades Papa Roach have established themselves as true trendsetters in rock music and with their new album, Who Do You Trust, the band are entering a whole new chapter in their career. In support of its release, they’ll be returning to the UK for their longest headline run to date, visiting venues and cities that have been on their bucket list for a long time.